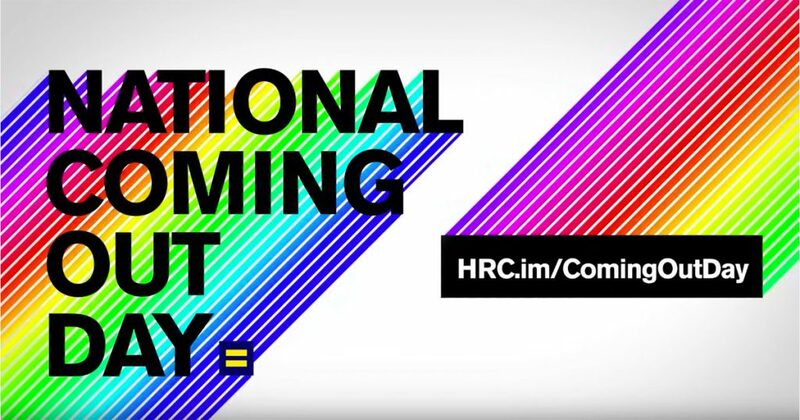 It’s National Coming Out day today, a well-intentioned US campaign to persuade LGBT people to love themselves and live their authentic lives. Here are some people sharing their coming out stories on BBC’s The Social. That’s not to say coming out isn’t a good thing. Of course it is. But it’s also an incredibly big deal that can have incredibly big consequences, not just when you first come out but for the rest of your life. Coming out isn’t an event. It’s a process. I come out again every single time I walk out the front door. The cartoon on the right, by Iria Villalobos, is popular in trans circles. 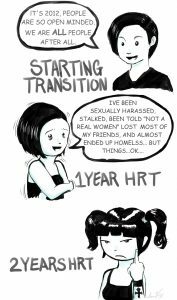 For many trans people, coming out is the beginning of a process of transition: not necessarily medical, but transition nevertheless. It’s funny, in a bleakly accurate way. I’m currently in the second stage, moving towards the third. I came out just under two years ago. Since then everything in my life has changed. My marriage has collapsed. I’ve lost tons of friends. I’ve become estranged from people I was previously close to. I’ve been abused and harassed and humiliated. At some points I’ve come perilously close to checking out. Even now there are days when I just can’t cope. And that’s as a middle-class white person who works in a tolerant, inclusive industry and who lives in a tolerant bit of the world. I’ve got it easy. And yet nothing about coming out has been easy. If it’s safe for you to come out and you feel strong enough to deal with the consequences, great. The more of us that are out and getting on with our lives, the easier things will become for the people who’ll come out after us. But not everybody is in a safe environment, or is mentally ready. And if that’s you, that’s fine. There’s no right or wrong way to do this, and you’re no less valid if you decide that coming out isn’t right for you. The most important thing is your safety, both physical and mental. Look after yourself. The world is a better place with you in it.